Up for consideration is Night at the Opera, a beautiful two piece ensemble designed for Robert Tonner's 17" DeeAnna Denton dolls. 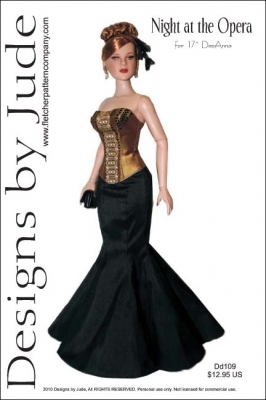 The pattern includes a fully lined floor length skirt with zipper back and a bustier with lace up eyelets. This will also Lara Croft and the other Deluxe Super Hero females. 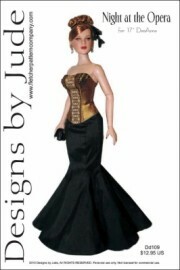 This design is also available for Tyler and Ellowyne Dolls. Lining: lightweight cottons, batiste, china silk. Notions: 12ct. 1/8” eyelets and 12ct. 1/8” eyelet washers (optionally you may use 4ct. 4/0 snap sets, ribbon for lacing corset, 1ct. 4 ½” doll zipper, matching thread.